In just a few minutes from now your chest is going to be stronger, more toned, and you’ll have more energy coursing through your whole body! Chest Exercise Isometrics focuses on the strength and tone of the pectorals both upper and lower (the major muscle of the chest) – but it also works the assisting muscles of the triceps (back of the arms) and the deltoids (your shoulders). Breathing during isometrics is also very important. You should NEVER hold your breath during Chest Exercise Isometrics or any other body part for that matter. The best way to breath is by taking a deep breath prior to an exercise and while tensing the stomach slowly “hissing” it out like a flat tyre or a snake. This will cause extra tension and power allowing you to push harder and really get the best results. I highly recommend that you check out 7 Seconds to A Perfect Body - my complete Isometric strength training system. With a detailed program and incredible instruction you’ll get to your goals quickly and efficiently. In the push up position, lower yourself to the half way point. Breathe out and tense your muscles. Concentrate on making your chest as tight and hard as possible. After a few seconds you should feel like you’re shaking all over – this is your body working really hard – this is Isometrics. 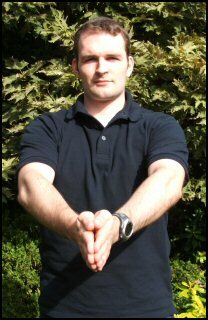 Place your hands at chest level on either side of the doorway. Pull in as though you were trying to press the two sides of the wall together. As you do so concentrate on making your chest as tight and hard as possible. If you’ve followed the above Chest Exercise routine it should have taken no longer than 2 minutes and you have just done a complete chest workout! Your chest should feel warm (maybe slightly stiff if this is your first time), relaxed and powerful.